2. a cartilaginous, fatty, fibrous, or membranous structure enveloping another structure, organ, or part. adj., adj cap´sular. Capsule. Generalized structure of a synovial joint showing the joint or articular capsule. From Applegate, 2000.
articular capsule the saclike envelope that encloses the cavity of a synovial joint by attaching to the circumference of the articular end of each involved bone. Called also joint capsule. adipose renal capsule the investment of fat surrounding the fibrous renal capsule, continuous at the hilus with the fat in the renal sinus. bacterial capsule a gelatinous envelope surrounding a bacterial cell, usually polysaccharide but sometimes polypeptide in nature; it is associated with the virulence of pathogenic bacteria. Bowman's capsule the globular dilatation forming the beginning of a renal tubule and surrounding the glomerulus. Called also glomerular capsule and malpighian capsule. c's of the brain two layers of white matter in the substance of the brain; external capsule and internal capsule. external capsule the layer of white fibers between the putamen and claustrum. fibrous renal capsule the connective tissue investment of the kidney, which continues through the hilus to line the renal sinus. Glisson's capsule a sheath of connective tissue accompanying the hepatic ducts and vessels through the hepatic portal. In hepatitis it may become stretched, which is a common cause of pain. internal capsule the fanlike mass of white fibers separating the lentiform nucleus laterally from the head of the caudate nucleus, the dorsal thalamus, and the tail of the caudate nucleus medially. The internal capsule carries both afferent and efferent fibers of the cerebral cortex. capsule of lens the elastic sac enclosing the lens of the eye. capsule of pancreas a thin sheath of areolar tissue that invests the pancreas (but does not form a definite capsule), the septa of which extend into the gland and divide it into lobules. renal c's the investing tissue around the kidney, divided into the fibrous renal capsule and the adipose renal capsule. Tenon's capsule the connective tissue enveloping the posterior eyeball. a sac enclosing the articulating ends of the bones participating in a synovial joint, formed by an outer fibrous layer and an inner synovial membrane. an envelope of tissue that surrounds a freely moving joint, composed of an external layer of white fibrous tissue and an internal synovial membrane. See also fibrous capsule. A sac enclosing a joint, formed by an outer fibrous articular capsule and an inner synovial membrane. Synonym(s): capsula articularis [TA] , joint capsule. 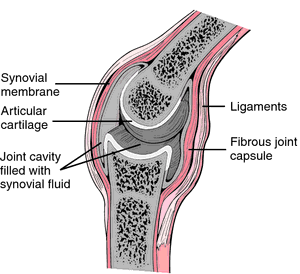 An envelope of tissue that surrounds a free moving joint, composed of an external layer of white fibrous tissue and an external synovial membrane that secretes a lubricant into the joint. We also agree with Wierusz &Wozniak (2004) when relate that in fetuses of 9 and 10 weeks, the articular disc is connected with the articular capsule and lateral pterygoid muscle. Regarding the comments above, the following conclusions were obtained: the fibers and the thickness of the articular disc, as well as, the articular capsule and the condylar process, suffer modifications according to age; the superior head of the lateral pterygoid muscle is inserted in the disc and in the articular capsule, in all the studied ages; the maturation of the articular tissues, in special the articular disc, as well as, the associated muscles suggest that the TMJ was capable of doing mandibular movements from the 24th week of intrauterine life. The oblique ligament represents a reinforcement of the articular capsule and therefore has not been named by the International Committee of Nomenclatura Anatomica Veterinaria (NAV,1994). Evans defined the oblique ligament as a small bundle of fibers in the articular capsule, which arises from the dorsal margin of the supratrochlear foramen and crosses the elbow joint distally and medially to the tendons of the biceps brachii muscle and brachial muscle, and at the level of these tendons the oblique ligament divides into two parts: cranial and caudal portions. Maximum length between the points of origin and insertion of the caudal portion of the medial collateral ligament (measured from the medial epicondyle to the caudolateral surface of the proximal portion of the radius) and cranial portion of the oblique ligament (measured from the articular capsule in the region of the lateral condyle of the humerus to the proximal and medial margin of the radius). The cranial portion is short and fuses with the articular capsule and with the caudal or short portion of the oblique ligament. 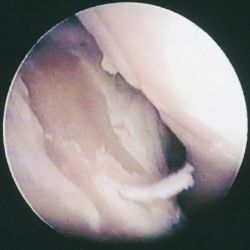 The oblique ligament is a thin whitish structure presenting as a cranial reinforcement of the articular capsule (Fig. mentioned that the cranial portion is indistinct and seems to be just a slight thickening of the articular capsule, attaching to the proximal medial surface of the radius. The oblique ligament was found to be fine and whitish, appearing to be a cranial reinforcement of the articular capsule of the elbow.